What do bed bugs look like? 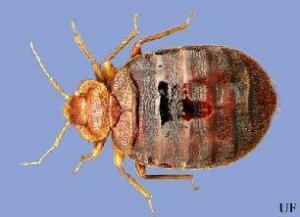 Adults of the common bed bug (cimex lectularius) are about 1/4 inch long, reddish to dark brown in color with flattened bodies. They cannot fly, but can run quickly. Eggs and newly hatched nymphs are pale and very tiny – the size of a pin head. Bed bugs are spread easily by “hichhiking” on all types of household items, such as clothing, bedding, furniture, luggage, back packs, and animal cages. Although bed bugs prefer to infest wood and fabric to metal and plastic surfaces, they have been found infesting electronic devices, such as alarm clocks, and hollow perches in bird cages. Require at least one adult occupant from each unit to attend group meeting(s) to explain preparation procedures and answer questions. Have attendees sign a check-in sheet at each meeting. Set-up checkpoints manned by authorized personnel to screen occupants as they are leaving before the fumigation and returning after the fumigation to ensure compliance (as much as possible) with preparation requirements for bed bugs fumigations. 3. Add clauses in the fumigation contract that are specific for bed bugs control. Clauses to consider could include responsibilities for reinfestation and exclusions for medical expenses and repair or replacement of items due to infestation be bed bugs. Consult NPMA’s Sample Bed Bug Contract for further information. 4. 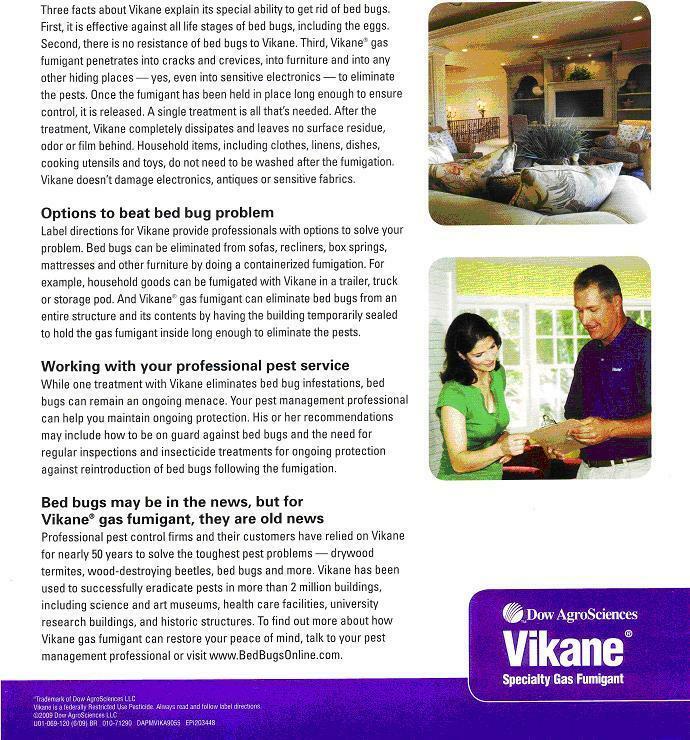 Monitor bed bug fumigations using fumiscope to document and confirm sufficient dosage (3X the drywood termite dosage) is accumulated to kill bed bugs. 5. 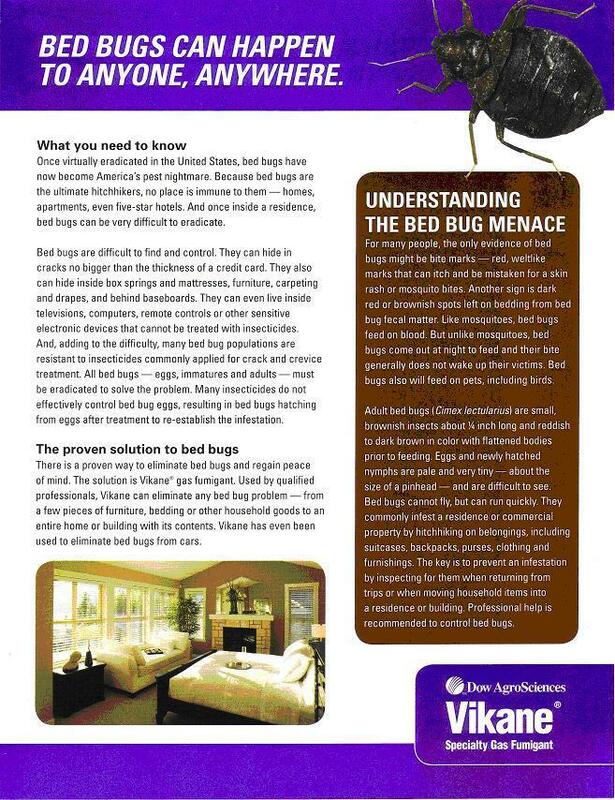 At this time, the veterinary community is largely unaware of the re-emergence of bed bugs. Warm-blooded pets including birds can serve as important hosts, and pet cages and bedding can be sorces of infestation. The American Veterinary MEdical Association currently has no guidelines or information available to veterinarians and the public on bed bugs. Bring as few items as possible when leaving the residence for the fumigation. Remember, bed bugs hitchhiking in suitcases, pack packs, boxes, clothing, bedding, and pet cages is a common way for these insects to be introduced into buildings. Bed bugs have been found infesting small electronic devices, such as alarm clocks. For all fabric items that will be taken out of the residence during the fumigation, wash in hot water and dry in high heat in dryer (140 degrees F) before returning them to the fumigated residence. This includes clothing, blankets, pillows, stuffed toys, and pet bedding. Do not use boxes, suitcase, pack packs, gym bags, or any similar items from the infested residence to pack belongings. These items should remain in the residence to be fumigated. Pack belonging needed during the fumigation in light colored or clear plastic bags or plastic containers, such as sweater boxes, or new luggage not previously stored in the infested residence. Do not place washed or pack items on furniture (beds, sofa, dressers, tables, ect.) 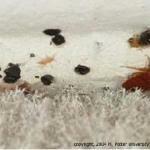 or flooring (carpet or rugs) that may be infested with bed bugs. Immediately remove packed items from the infested residence or place them on a clean, hard surface (kitchen or bathroom floor, in a bath tub or shower) until they can be removed from the residence. Mattresses completely enveloped in plastic covers that cannot be removed, such as infant mattresses, cannot be fumigated. These mattresses must be removed prior to fumigation. 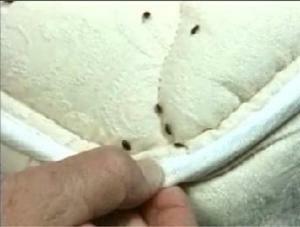 If there is any evidence that such a mattress is infested with bed bugs or the individual sleeping on the matress has been bitten by bed bugs, it is advised that a new mattress be purchased. Pet cages and pet bedding should be fumigated. Pet cages with any small gaps, seams, or hollow spaces that could harbor bed bugs should be left in the residence to be fumigated. Food in the cages should be removed prior to the fumigation. The pets should be transfered to new travel cages or housing known not to be infested with bed bugs to remove them from the residence prior to the fumigation. Pet bedding/blankets should not be removed from the residence before the fumigation unless they can be washed, dried, and packed as described above.